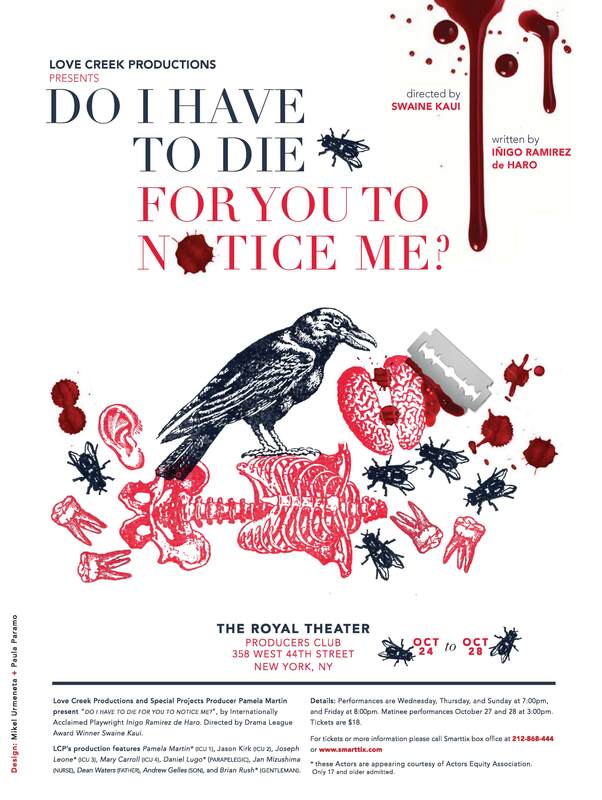 Love Creek Productions, the award-winning theater, under the leadership of Le Wilhelm, and special events Producer Pamela Martin, is proud to present Do I Have to Die For You to Notice Me? by internationally acclaimed Inigo Ramirez de Haro. Directed by Drama League award winner Swaine Kaui. Do I Have to Die For You to Notice Me? runs October 24-28 in The Royal Theater at Producers Club, 358 West 44th Street. The press opening is Wednesday, October 24 at 7:00pm. DO I HAVE TO DIE FOR YOU TO NOTICE ME? This contemporary masterpiece of intense black comedy creates an amazingly funny and witty topsy-turvy world that puts your values to the test. Why are we scared of the unspoken, the taboo, the dark side…death? Since the beginning of time great men have understood that death is part of life, for without death there is no life, and without life there is no death. There is no security only uncertainty. Inigo torpedoes us into surrealistic situations where you don’t know anymore what’s right, what’s wrong, what to think, or what to feel…you don’t know if dreams become true or truths become dream, nightmare…you don’t know whether to laugh or cry, die or make love. Family, Medicaid, Euthanasia, Love, Suicide, the 1% and the rest of Us, Human relations, our place in Nature, the Government…leaps into this celebration of life! Joy!…Enjoy! !…Enjoy Death!! !